Barbara Kingsolver got me out of my local chain grocery, into the Guzzler, and out to the farms. I thank her mentally for writing Animal, Vegetable, Miracle and I thank my Mom and sister for telling me to read the book. The narrative covers a year in the life of Kingsolver’s family, once they chose to move from the drought of Arizona to a farm in Georgia. The decision was made to live on what they could grow, a commitment made to eat seasonal food instead of grocery store food. Husband Steven Hopp provided a little known (and frightening) insight into the big Ag companies, while daughter Camille documented recipes and gave a young person’s view of the experience. Since reading it, I have driven 700 miles on Saturdays in 4 months to explore this thing called local food. I discovered an intriguing world I need a part of, every week. I strike out most weekends to visit farms and marvel at how close to home they are! 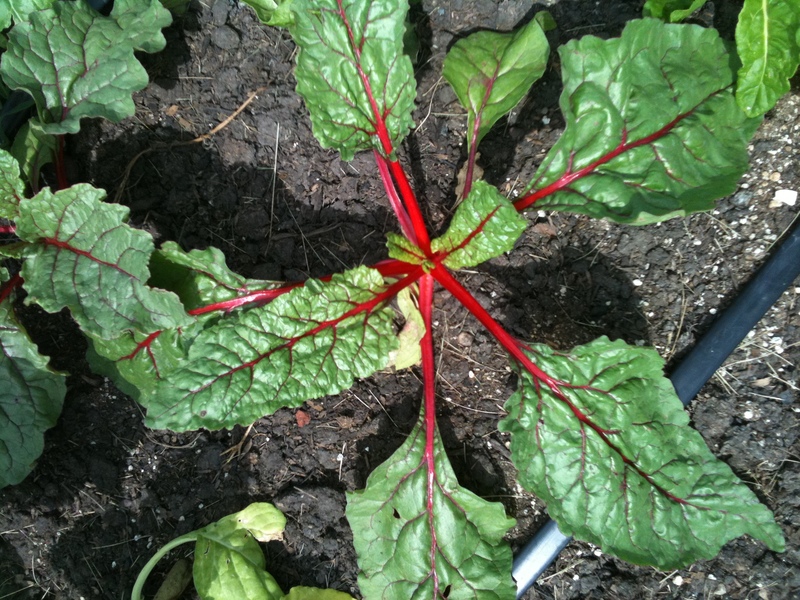 I stop to cherish the crimson stalk that runs up the middle of a bumpy leaf of Swiss Chard, sun coming through it like stained glass. I see brown egg as house for a baby chick at Kinnikinnick. A big Polish dog smiles in a warm kitchen during an April snow there and I hug him. I tour that farm on a bitter day and find art at every turn. 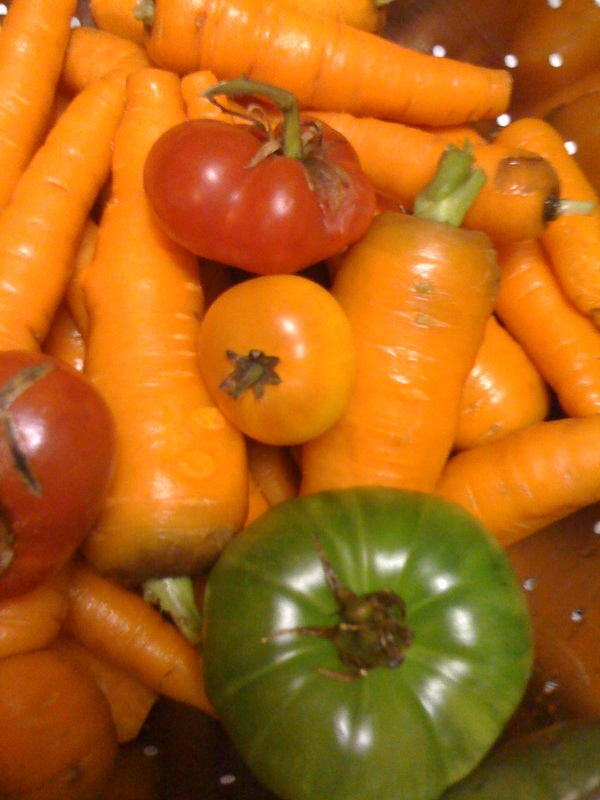 I pull a carrot out of the soil and rinse it off and marvel at its orange tastiness at Erehwon. Please, stop buying those dried out little nubs called baby carrots, and switch to the long ones with dirt and greens attached. It takes 5 minutes to clean them and the flavor is beyond compare. I see the ripening heirloom tomato tucked beneath the jagged leaf on my Cherokee Purples and my mouth waters. I eat the delicate yellow squash blossom offered by Farmer Tim, I smell the red sugar of a crushed berry on a walk through a field. I bathe with goat milk soap, pamper myself with goat milk lotion from Majestic Heartland. I take close up pictures of bright green garlic leaves, of tractors, rows of lettuce, shadows, purple baby eggplant. I touch noses with a snow-white goat at The Learning Center and love her hazel eyes with horizontal pupils, her pregnant belly and the way she lets me feel her kids move. 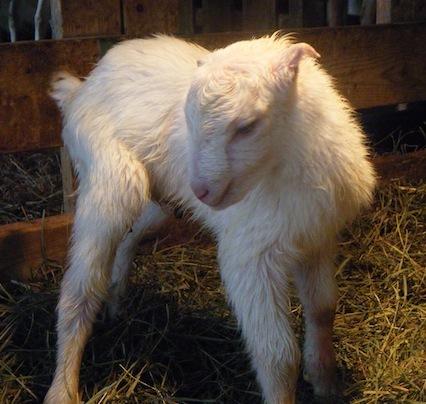 I love the pictures they email to me when the kids are born, wobbly babies in white and black. I connect with the artist (without meeting him or her) at Angelic Organics; the painted goat trailer, barn door, the poem of peaches and summer. My first knowledge of CSAs gained there inspired me to learn more. I slap the neck of the draught horse and scratch behind his dusty ear and he leans into it and his eyelids droop and he snuffles. I taste the dust and am grateful for cold water when offered. I stand next to bee hives at Norton Farm and let them buzz me and I buy their honey with new appreciation for their talent. I study weathered wood and rusty hinges and wine at McEachran Homestead, the flowers Kate takes time to plant between crops at Wiltse’s, the stones that have held up barns for a hundred years. The smell of manure drifts by every Saturday I’m out there, rich with the nutrients it will give. The barn cat climbs my leg and demands a hug at Wind Ridge, the herbs are fragrant and plentiful. The horses whinny and greet me at the barn door, let me touch their velvet lips. I spend time at Waldron Grove and meet alpacas and artists. I learn alpacas like kisses, not hands, and that their wool can be tolerated by folks who cannot wear sheep’s wool. I find out the wool is called dreadlocks and it is one of the softest things I have ever touched. I read about pasture farming, planting, goats, heirloom seeds, why it’s all important, my interest renewed at every turn. My mind fills with wonder as my boot heels sink into manure. I like the way these Saturdays are my slower day. I love the order, the planning, the rhythms, the constant adaptation to change on farms. I see art in every plant and creature and I think I understand what keeps these people getting up and going on, no matter what adversity hurls itself at them that day. I dig these little slices of life, adventure put before the farmer, the creativity that no one else sees or thinks about that makes food the miracle it is. I drive home, 10 miles, 50 miles, racing clouds and thoughts and rain, itching to get to my keyboard and tell the next story. I thank each and every one of you for sharing time, interests, for reading this blog and offering your comments and feedback. This is only the beginning, friends. You go girl!!! You are a farm girl at heart and your descriptive writing makes me want to move back to the midwest! ….Oh and I love the Farmall Tractor, since that’s where my dad (God bless his soul) worked his entire life before that were sold, merged, or whatever! So glad to connect with you this way. Come visit, I’ll take you on a tour! Good work, Mary. Thanks for writing about what the rest of us wish we were doing! Kelly, I would like nothing better than to broaden my territory and share information! On the other hand, I get 2 weeks of vacation per year, so it isn’t likely in the immediate future. As soon as I can, I will! Well, I still want to move AWAY from the Midwest, but I do love your stories and your writing. I think you should transition from “mental” to “real life” organic farmer sooner rather than later – after all, you already have the perfect parcel of land in NC just waiting to be planted and tended to.